The 75th edition of the Register's All-State football team will be released on Sunday. It's the oldest high school all-state team in Connecticut, and in the opinion of most coaches and players, the only one that matters. I remember an old Register reporter telling me of a meeting in the early 1990s with Bill Romanowski, a Vernon native who was a couple of years into his NFL career and a two-time Super Bowl champion at that point. Romo was at Giants Stadium for a game, and the reporter introduced himself as being from the New Haven Register. Romo, never known for his patience or relaxed demeanor, had a few choice words for the reporter about being left off the Register's All-State team, then walked away in a huff. Hey, you can't win them all. Even the great Steve Young of Greenwich High only made second-team all-state behind Seymour's Tom Heffernan in 1979. Dave Solomon wrote a great column a couple of years ago on that and how Hefferman has gone through life as the man who beat out Steve Young for all-state quarterback. But it's about who's the better high school player, and it's a difficult task. The Register staff has done an outstanding job of nailing the teams for the past 75 years. It's always something to look forward to and reflect back upon. The best second-team All-State quarterback ever. Anyway, it seems like a good opportunity to open the discussion to you, the reader. Who was the best high school player you ever saw? The Runway readership extends well beyond our Connecticut borders, so let's hear from everyone. I'll get the ball rolling. Having covered college football for the last eight years, I'm only afforded the opportunity to see one or two high school games a year, if that, these days. I've missed out on viewing some outstanding kids for the last decade or so. So my list isn't the best players, but some of the most memorable. Greg Laugeni, Amity, TE/P: My oldest sister was a cheerleader at Amity in the early 80s, and I remember being dragged out one Saturday morning to go watch her cheer. That wasn't exactly the most thrilling pitch for an 8-year old who spent most Saturday mornings in front of the TV watching cartoons. But I was immediately sucked in by the high school football atmosphere, and amazed at the size of the players -- especially Laugeni, who was about 6-foot-5, 225 pounds. I had never seen a human being that large. Laugeni was an outstanding tight end, but he also murdered the football on punts. He still holds the state record for highest punt average in a season (45.8) and is second in career average (41.8). He went on to play TE at Holy Cross. Scott Burrell, Hamden, QB: While at Amity, we had the occasional misfortune of trying to stop Burrell, who I first encountered at an 8th-grade basketball tournament in Branford. He broke loose on a fast break and dunked. The referees were so shocked they called a technical foul because, they said, dunking wasn't allowed. As if shattered backboards were a primary concern for 13-year olds. Burrell was a first-round draft pick in baseball as a flame-throwing pitcher and later in basketball after his storied UConn career. But not many remember Burrell was a strong-armed, if raw, quarterback who led Hamden to the Class LL state championship game as a junior. He could throw the ball a country mile -- I'm convinced he chucked one 75 yards in the air -- and was reportedly receiving interest from top schools like Miami to come play QB and baseball. But he gave up football before his senior year to concentrate on hoops and baseball. Tarek Saleh, Notre Dame-West Haven, RB/LB: The Amity coaching staff was dismayed when Saleh, who lived in Woodbridge, decided to attend Notre Dame. He was first-team all-state as a junior at linebacker, then repeated the honor as a running back (along with New Britain's Tebucky Jones) his senior season. He ran over would-be tacklers for touchdown after touchdown, then flipped over to linebacker where he flattened everthing in sight. 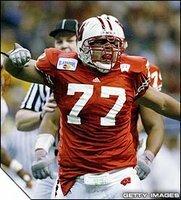 Went on to an All-American career as a defensive end at Wisconsin and spent five seasons in the NFL. Jason Scheets, Foran-Milford, QB: My first job out of college was covering Foran High football for the old Milford Citizen. As luck would have it the Lions, a perennial lovable loser, produced their best team ever that year. They went on to beat Hand-Madison for the Class M state championship, the school's first and only football title. Foran had several outstanding players, but Scheets was at the controls of the offense. Didn't look like much of an athlete, but the strong-armed lefty never missed an open receiver and racked up TD passes. Went on to star for the University of New Haven baseball team. Horace Dodd, Hamden, RB: A smooth runner whose feet didn't appear to be touching the ground as he raced for all those 90-yard touchdowns. Reminded me of a young Marcus Allen. Played at Penn State and Boston College. James Glee, East Haven, RB: I had to cover the East Haven-Branford Thanksgiving Day game in an unrelenting downpour in 1998. This was at the old East Haven High field, well before the beautiful new field turf was installed, and it was a mud pit. It looked like Pimlico on a bad day. But Glee proved to be one tough mudder. He raced for 327 yards and four or five TDs. Went on to play defensive back at Hofstra. Anttaj Hawthorne, Hamden, OL/DL: Hawthorne, now in his second season with the Oakland Raiders, is listed at 6-foot-3, 310 pounds. I swear he was that big the first time I saw him play as a high school freshman. Went on to Wisconsin, and hasn't missed a game for the Raiders this season. Antajj was this big as a high school freshman. Kory Sheets, Bloomfield, RB: I saw Sheets play once. I was assigned the Class SS semifinals against Notre Dame-Fairfield at Bloomfield. It was about 5 degrees, and the field was frozen solid into a slab of earth with the consistency of concrete. No matter. Sheets was like Superman. He had 323 yards rushing at halftime. The total was up to 403 yards and four touchdowns on 19 carries when they pulled him with 5 minutes left in the third quarter. It's now the 7th-highest total in state history, but I'm willing to bet Sheets would have topped 650 yards if he played the final 17 minutes. Currently a touchdown machine at Purdue. Who's the best you've seen? Let's hear it. "Comments" key below is open. The best high school football player I very saw was Scott Lutrus RB/LB, Brookfield, CT. ran with Power and Speed. Selected ALL-State by the New Haven Register, Hartford Curant and The CT.Post. Now a freshman linebacker at UCONN. I am a HS referee in Central CT, and played in the early 90's in the CCC South. Back in the day Tebucky Jones was unreal, but Aaron Hernandez is a man amongst boys. Growing up in the valley, i saw players like Edwin Esson from Seymour. He was listed as 6' 225..but he was more like 5'10" 235. Went to Missou but was oft injured. High scholl Parade 1st team all american. If you look at pure stats and game "IQ" take a peek at Joe Stochmal. From Seymour High to SCSU (first SCSU team to beat UNH)now the O Coordinator for Hillhouse. Sandy Osieski from Ansonia, who went on to play at ASU and then with the KC Chiefs for a brief stint. Ben Blue was a mountain at Derby. Played at Yale. Cant forget Dan Orlovsky from Shelton. I dont ever remember Shelton throwin the ball prior to Dan's sophmore year. Outside of the valley i saw Rico Brogna, who was the best athlete i ever saw in highschool. His receivers had a hard time catching his throws as there was so much velocity on them. He may have been a better kicker (scholarship from Clemson) but he settled on pro baseball. A few others i've seen, either on tv (MSG)or in person in h.s. 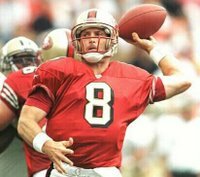 According to rankopedia.com, the best quarterbacks ever are Marino, Montana and Favre, in that order. David Thompson from Daniel Hand in Madison back in the early 80's was a stud. Also Jim Bell RB who both later played at BC were two of the best I have ever seen. If you're talking about Brookfield HS football, you can't leave out the entire 95-96 team. 13-0. Only State Championship and undefeated team. In particular, RB Daryl Bates and WR Jeff DaCunha. Both had break away speed that has never been matched at Brookfield past or present. DaCunha scored virtually every time he caught the ball. You have to mention Daryl Bates and Jeff Dacunha, I remember watching those two play, they had blazing speed. They were also track stars. I heard Jeff Dacunha was a Decathlete at Baylor, and Daryl Bates played safety at Georgia Southern and won a National Championship. "You have to mention Daryl Bates and Jeff Dacunha, I remember watching those two play, they had blazing speed. They were also track stars. I heard Jeff Dacunha was a Decathlete at Baylor, and Daryl Bates played safety at Georgia Southern and won a National Championship." Where are they from? I never even heard of them. Bates and Dacunha are from Brookfield. 1995 State Champs.